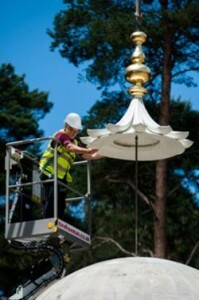 Excell Metal Spinning Ltd. was approached by a regular customer in regards to a Bespoke project which involved the production of the Finial that was to be part of, and displayed, in the restoration of the Muslim War burial ground in Woking. Due to the sophisticated design of the Finial, Excell Metal Spinning Ltd. realised that nine different tools were required to achieve the desired look to which the Finial is famous for. It was to be made in halves on a traditional hand spinning lathe, and upon completion of each of the components, they were to be copper welded together, after careful inspection on the dimensions. The inspection followed ISO 9001:2008 and BSI standards which ensured the very best quality was maintained. To further increase the quality as well as the speed of the project, Excell assigned the most experienced hand spinner within the workforce. This allowed for a flexible, easy service for the customer, and Excell was therefore able to meet the desired deadline. The Finial was finally gilded in a gold coating ready to be displayed within the War burial grounds. Excell’s customer was very pleased with the outcome of the Finial, which is now on display in Woking as part of the Muslim soldier’s burial grounds. It also featured in the BBC’s documentary ‘Britain’s Muslim Soldiers’. (www.bbc.co.uk/iplayer/episode/b06vb8rv/britains-muslim-soldiers) At 19:00 within the video provided, features the Finial, produced by our very own spinners.